I loved seeing Allison's and Rebecca's blogs. 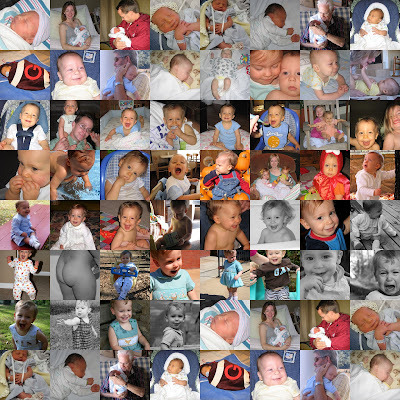 Here's a glimpse of 2 years with our special boy, who (after teething) has brought us the most laughter and smiles. If laughter indeed prolongs your life, my son will live many, many years. the picture of Brook's hinny is entitled, baby got back. I love you son. Kristi, thanks for coming by to see me so often & taking the time to leave a note! Haha, I love the booty pic! I love this collage. I hope you have a copy of it printed & if not you may need to invest in one, what a great idea. I cannot believe he is already two!! My mouth dropped when I saw this. Time flies way too fast sometimes.